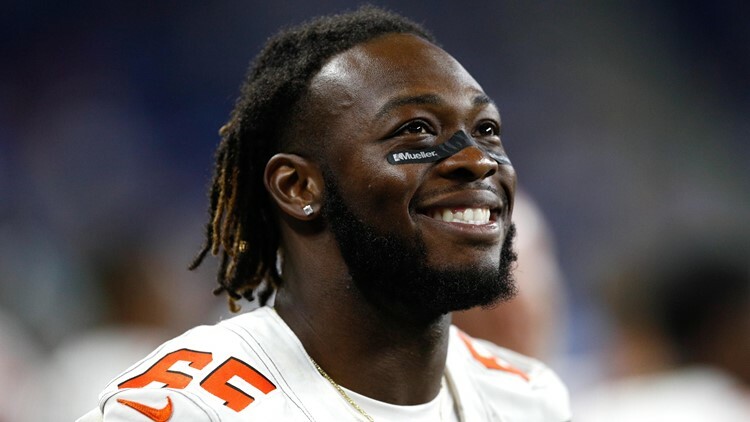 Cleveland Browns defensive tackle Larry Ogunjobi (65) smiles from the sidelines during the fourth quarter against the Detroit Lions at Ford Field in Detroit. Cleveland Browns defensive lineman Larry Ogunjobi has gone from "hard worker" to "playmaker." CLEVELAND -- By working with him at the 2017 Senior Bowl, the Browns learned the kind of worker defensive lineman Larry Ogunjobi was when it came to perfecting his craft on the football field. And just three games into the 2018 season, the 6-foot-3, 305-pound Ogunjobi is well on his way to proving the kind of player he can be, as he is already approaching single-season career bests in tackles, solo stops and assists, and has surpassed his sacks total from 2017. “It has been his grind,” Browns coach Hue Jackson said. “He grinds. It is important to him. He works at it. He always wanted to be the best. Sometimes, Larry can overthink a little bit, but he works his tail off, and he has a burning desire to be really good. Cleveland Browns defensive tackle Larry Ogunjobi (65) reaches for a fumble by the Philadelphia Eagles during the first quarter at FirstEnergy Stadium in Cleveland. In 24 games over two years at UNC-Charlotte, the 6-foot-3, 297-pound Ogunjobi registered 127 total tackles, including 68 solo stops and 59 assists. Of the 127 total tackles, 29 went for lost yardage, including 5.5 quarterback sacks. During his first season with the 49ers, Ogunjobi totaled 37 solo stops, 25 assists and 62 total tackles, including 15.5 for lost yardage with 2.5 sacks. As a follow-up in 2016, Ogunjobi registered 65 total tackles, including 31 solo stops, 34 assists, 13.5 for lost yardage and three sacks. That production at UNC-Charlotte has translated to success at the NFL level, as Ogunjobi currently is tied for sixth in the NFL with three sacks in the first three games of the season, while his fellow defensive lineman, Myles Garrett, is tied for the top spot in the league. “It is everything,” Jackson said of Ogunjobi’s ability to set a tone up front. “I think that is how you make it go. You have to worry about him there, which I think gives Myles (Garrett) flexibility or you have to worry about Myles and it gives him flexibility. Hopefully, our guys can keep growing. 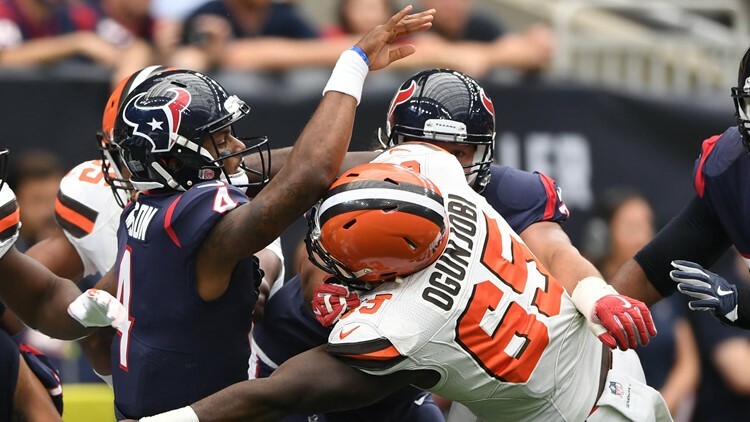 Houston Texans quarterback Deshaun Watson (4) is brought down by Cleveland Browns defensive tackle Larry Ogunjobi (65) during the first quarter at NRG Stadium in Houston. 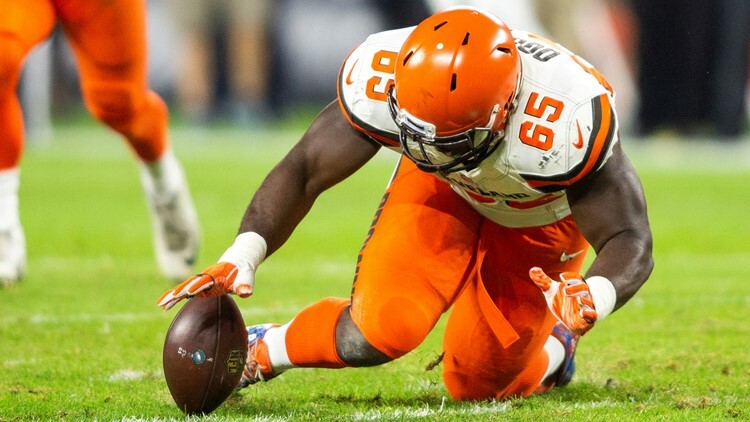 Browns defensive coordinator Gregg Williams is proud of Ogunjobi’s development, and believes plenty of good things are in store for the second-year interior lineman.